If light scarring, sun damage or discoloration are affecting your self-esteem adversely, Microdermabrasion might be the easy answer to that. There is also a suction mechanism to lift off the dead skin. Microdermabrasion works like a very fine sand blaster. It uses micro-particles, or a diamond-tipped wand, to remove the top layer (epidermis) of your skin and stimulate new skin growth. Dynamics of facial expression: Excessive movement of frown lines is not the only aspect of anti-wrinkle treatments. Microdermabrasion is a personalized treatment plan that is tailored to the individual. To preserve the uniqueness of every client aesthetically, we offer each patient a customized plan to cater to his/her unique face and issues. Microdermabrasion is often called a "lunch hour" treatment because it's a quick procedure that can be performed at a doctor's office during your lunch hour with little or no discomfort.Some patients may experience some minor redness or discomfort very much like how a sunburn might feel, after the microdermabrasion treatment—however, a soothing, calming mask is applied following microdermabrasion to help reduce sensitivity. While some patients may experience very slight discomfort around the eyes, your skin will adjust as the treatment continues. Our dermatologist will probably advise you to avoid any activity that could cause a bump to your face for at least two weeks. More active sports, especially ball sports, should be avoided for four to six weeks. If you swim, stick to indoor pools to avoid sun and wind, and keep your face out of chlorinated water for at least four weeks. It will be at least three to four weeks before you can drink alcohol without experiencing a flush of redness. The average Microdermabrasion procedure takes less than thirty minutes, depending upon the skin condition, the area to be treated, and the desired outcome. The exact number of microdermabrasion treatments need is based on the individual patient and the condition of his or her skin. On average, you can expect anything from five to six treatments. 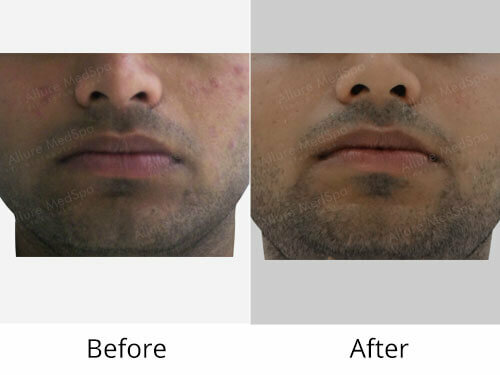 You will see an immediate difference in the overall look and feel of your skin after your microdermabrasion treatment.Patients experience softer, smoother and cleaner skin after the first treatment, with improvements becoming more drastic and noticeable after each successive therapy session. Allure MedSpa which is renowned for its state-of-the-art internationally acclaimed services,offers affordable and cost effective skin rejuvenating procedures. To know more about the cost of your procedure request a consult by filling the form below. Your consultation is your chance to ask questions about Face Rejuvenation treatments and put your mind at rest. Our surgeons and cosmetologists will be there to offer full explanations and answers to all of your queries. Men and women of all ages, from young people to older adults, can benefit from dermabrasion. Although older people heal more slowly, more important factors are your skin type, coloring, and medical history. People who develop allergic rashes or other skin reactions, or who get frequent fever blisters or cold sores, may experience a flare-up. If you have freckles, they may disappear in the treated area. Candidates who have had a recent chemical peel or other skin procedure such as collagen injections should wait a two to three weeks before undergoing microdermabrasion. Prospective patients should also refrain from waxing or tanning the skin to be treated for a few weeks before microdermabrasion treatment. Who is not a good candidate for microdermabrasion? Microdermabrasion is not recommended for people who have deep scars, active keloids, undiagnosed lesions, a recent herpes outbreak, warts on the face, active acne (stages 3 and 4), an auto-immune system disorder, or unstable diabetes. Pregnant women should not undergo microdermabrasion. Individuals with deep scars, facial creases, or other moderate-to-severe skin defects should consider a stronger treatment such as a chemical peel, dermabrasion, or laser skin resurfacing. 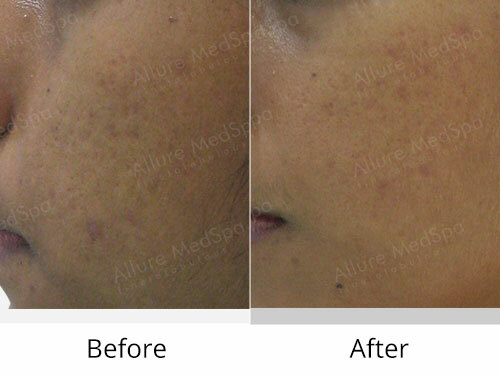 Why choose Allure medspa for microdermabrasion? As one of the India’s leaders in microdermabrasion, Allure medspa is setting a new standard for skin care. Our Microdermabrasion procedure is fast, predictable and virtually painless — so it’s the perfect lunch hour non-surgical cosmetic treatment. We believe that under your skin, there’s a new, more vital looking you just waiting to emerge – and through our microdermabrasion procedure, you could enjoy your rejuvenated appearance sooner than you might think. To find out more about microdermabrasion with Allure medspa, get us to call you back or order a brochure today. How does a microdermabrasion work? Microdermabrasion uses a highly controlled flow of fine, medical grade crystals to remove the dead outermost layer of skin. This skin exfoliation process reveals the new, living skin cells that are soft, smooth and receptive to nutrients. Because the Microdermabrasion procedure is performed under the supervision of a certified professional, you can be confident that you will be treated with the utmost care. How long does a microdermabrasion take? When will I see the results from microdermabrasion? Many patients notice improvements in the texture and appearance of their skin immediately after the first treatment. Your skin will feel vibrant and healthy and you will notice an immediate difference in your softer, smoother skin. There is virtually no recovery time, no discomfort and you can return to work immediately. Before you make a decision to go ahead with a Microdermabrasion treatment, you should call Allure medspa first to arrange a private, confidential consultation. Your consultation will include an evaluation of your skin type and a discussion of your skin care needs. How much does a microdermabrasion cost? For an estimate on how much a microdermabrasion cost, we recommend that you call Allure medspa on +91 22 26732961/62/63 for our latest microdermabrasion prices. Call Allure medspa today on +91 22 26732961/62/63 for specific information based on your individual microdermabrasion needs, or request a call back.